Save money with a generic equivalent! Dimensions approximately - 10" x 13" x 1 1/2"
In the "heart" of your whole-house humidifier is the Honeywell whole house humidifier filter, protecting your indoor space from the detriments of dry air and low humidity. As the weather gets colder, the humidity declines as colder air cannot hold as much moisture. Dry air in your indoor environment can raise a number of personal health concerns such as cracked skin, itchy eyes, bloody noses, and many other problems. To prevent this from occurring, install a Honeywell whole house humidifier filter into your filtration system. The Honeywell humidifier filter works to revitalize your indoor space by bringing moisture back into your indoor environment. The Honeywell humidifier pad (AKA humidifier filter, water pad, water panel) effectively brings moisture into your indoor space utilizing a special aluminum honeycomb mesh. This aluminum mesh pad is covered with a clay-like coating that is ideal for absorbing and holding water. The humidification process begins when water from the humidification valve comes into contact with the water panel. The clay coating absorbs the water and holds it until hot, dry air from the furnace or fan coil is pushed through the filter. The hot air heats the water from the Honeywell humidifier pad and creates water vapor. This newly created water vapor is then distributed evenly throughout the indoor space via the forced-air duct system. Moisture is brought back into the indoor environment, alleviating dry air issues and providing a comfortable living space. To ensure that your Honeywell whole house humidifier filter is running at maximum capacity, it is recommended that the water panel be replaced at least once a year. This can be either prior to the start or at the end of the heating season. 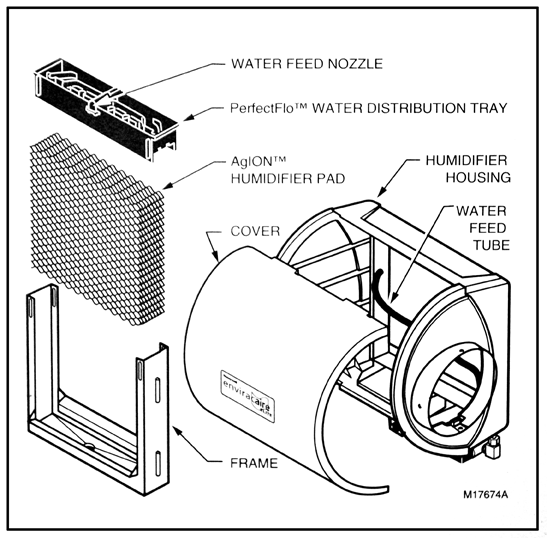 A filter in place for an extended period of time will begin to accumulate build-up on the filter mesh. 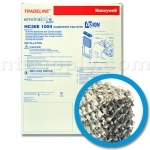 This will reduce the efficacy of the filter, potentially raising a number of health or maintenance concerns. To prevent this from occurring, routine filter changes should be performed. If you have especially hard water, the panel can be replaced 2 times per year.